I received a phone call from Bro. 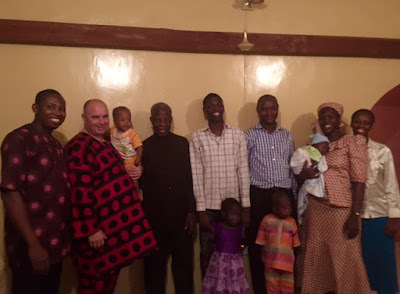 Shobanke this week and his call reminded me that I had not posted a summary of our recent trip to Nigeria. I know that many of you are interested in Bro. Shobanke and Nigeria so I want to make sure all the information is here to view. I hope you enjoy. 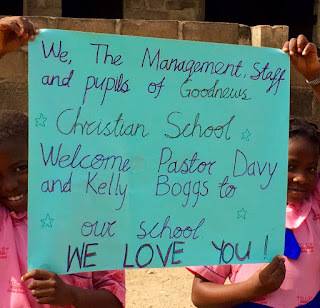 Our latest trip to Nigeria was filled with excitement and we enjoyed it very, very much. God blessed, helped and guided every step of the way and His hand was evident several times. It is very easy to pull back and try to control things myself but it is ultimately better if I can trust God to bring His will to pass in spite of everything I see going "wrong." 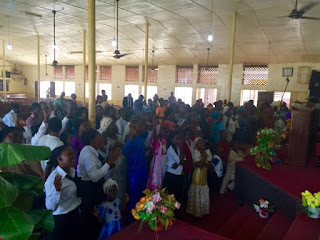 The first highlight of the trip was to preach camp meeting in Osun State for Christ Campaigners Church at the City of Mercy. Pastor Isaac Adewale was so kind to invite us and he, his wife, family and church treated us like royalty. I preached two nights of camp meeting there and a one day Minister's Conference. You can read about it HERE and HERE. Bro. Shobanke arranged all of our transportation to Osun State and went with us every step of the way. By Saturday night we were back in Abeokuta and getting ready for the Sunday services at Christ Ambassadors Holiness Church. 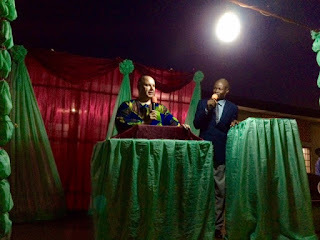 Sunday morning I preached in the church and Sunday night I preached the first night of the outdoor Gospel Crusade on the crusade grounds next to the church. You can read about Sunday HERE. 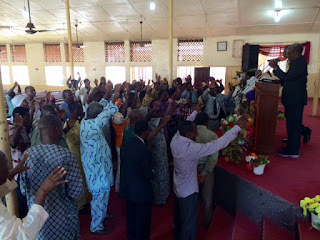 Monday, Tuesday and Wednesday nights we continued the Gospel Crusade with great success. The nights I made specific calls for the lost to come and be converted, God sent grace to dozens. Two nights I made a call for every one to come to the altar and both nights I had 100% response in the altar service. I was flying high to see so many respond to the help of God. You can read about the crusade HERE and HERE. We also visited the school one day. We love the work that the school is doing. Sis. Ruth and Sis. Rebecca and their staff are doing a super great work and we are thankful for it. We were able to take a few hundred dollars in school supplies, $200 for school supplies that can be purchased there, money to supplement Sis. Ruth and Sis. Rebecca's salaries and $1500 to complete the new classrooms that are badly needed. Bro. Shobanke told me Wednesday that the construction on the rooms is now completed and the painters were beginning now. Praise God! Thursday, Friday and Saturday I was preaching the Minister's Conference in Bro. Shobanke's church. We had three whole days of great services where we enjoyed fellowship with God's servants, studied the word, worshiped together and sought God's face. It was a time of great strengthening and encouragement. I love preaching to these guys and believe it or not, they love the preaching. They have wholeheartedly embraced us and they have accepted us like family. I can not tell you how good that makes me feel. These people are my brothers and sisters, there is no doubt about that. You can read about the conference HERE, HERE and HERE. We also took some money to help Dorcus as we do every year. Dorcus was saved in the Gospel Crusade in 2009 and has grown into a wonderful Christian woman. We love this lady very much. Dorcus had clothes made for each of us and melted my heart when she presented them to us. I am wearing mine in the pictures below. We were blessed to spend and evening with Bro. Shobanke's family and what a treat that was. The people you see below are my family. They have adopted me and I have adopted them. We were also blessed to take gifts for Bro. Shobanke's family, money for Christ Ambassadors Church, Bro. 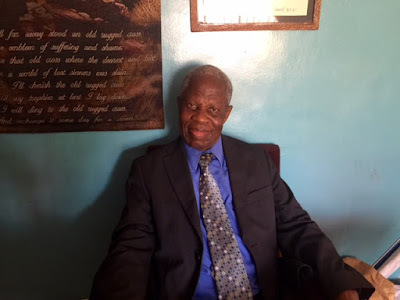 Shobanke, his Pastors, several preachers attending the conference and other Pastors and families as He led. Bro. Shobanke had a project in mind for the money we gave the church and I will tell you more about that when he sends pictures. Hopefully I will have pictures of the completed classrooms at the school soon. 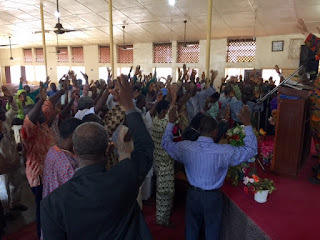 We are blessed to go to Nigeria with full hearts and full hands because you and the Lord make it so. Thank you to those that help us carry this burden for these wonderful people. God is doing a work in their lives as He is in ours and it is exciting to be on the side lines looking in. That pretty much sums up our Nigeria trip 2016. Thank you for praying and thank you for reading. Gaither Christmas Concert 2016 Columbus, Ohio.